Charge to your HSBC Credit Card and redeem for attractive travel luggages! 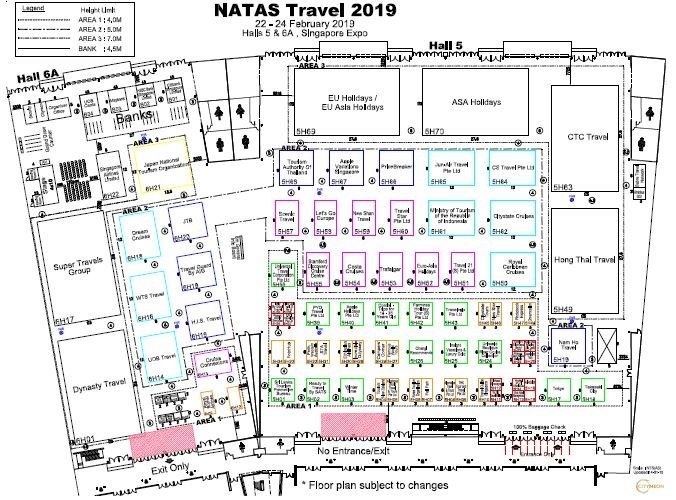 The NATAS Travel Fair is right around the corner! The fair will be hitting our shores from 22 - 24 February 2019, so be on the lookout for awesome travel deals for your next trip. Check out the latest travel packages from leading travel agencies, such as CTC Travel and WTS Travel, or speak to the representatives of various tourism organisations like the Tourism Authority of Thailand, and Korea Tourism Organization to find out the coolest and trendiest spots to visit. Why not travel off the beaten path this year and check out what the various booths have to offer that will give you a truly unique vacation? Cruise companies like Princess Cruises and Royal Caribbean have really caught our eye this time round, and we can't wait to see what incredible deals they have up their sleeves! NATAS is giving away some attractive prizes in their NATAS Grand Draw! Stand a chance to win a pair of business class tickets on Singapore Airlines to Seattle, a pair of business class tickets to Bali on Air France KLM, staycations in Vietnam, dinner buffets and many more! Customers are entitled to one Grand Draw chance with every $500 spent during the NATAS Travel Fair between 22 – 24 February. Yes! This includes purchases of anything from travel packages, air tickets, insurance and all related services provided by participating agents at the event! Do remember to keep your eyes peeled when they announce the winners on their website after the winners are drawn on 25 Feb 2019! Situated at the crossroads of 3 main expressways, East Coast Parkway, Pan Island Expressway and Tampines Expressway, Singapore EXPO is a 15-minute drive from the CBD and a 5-minute ride to Changi International Airport. Click here for more information about parking. Singapore EXPO has a dedicated MRT station next to Hall 6, which is also an interchange station, part of the Changi Airport branch line of the East-West Line and the Downtown Line in the Tampines planning area. Trains arrive every 5 minutes from Changi International Airport and Tanah Merah MRT station. A direct, more convenient way to arrive at Singapore EXPO is through the Downtown Line.